Soup! I love soup. It is the most versatile meal you can make and you can make subtle changes to any recipe to make the flavours completely different. You can also pack a good amount of vegetables into every bowl which means it is very healthy for you all around. In our house the Monkey and I are the soup eaters and if it were up to the two of us we would probably eat soup for lunch every day in the cooler months. I am lucky that he will eat almost any soup that I make as long as they include mostly vegetables he likes and do not have strong distinct flavours. Example too much curry or cumin is BAD. Due to all of our food restrictions, his as well as mine, I make homemade broth, both chicken and beef. It is fairly easy to make and chicken is by far the quickest so I will make a batch of chicken broth almost weekly and a batch of beef broth monthly. I have been known to sometimes heat up broth with leftover chicken and eat it for breakfast. Did I tell you I LOVE soup? 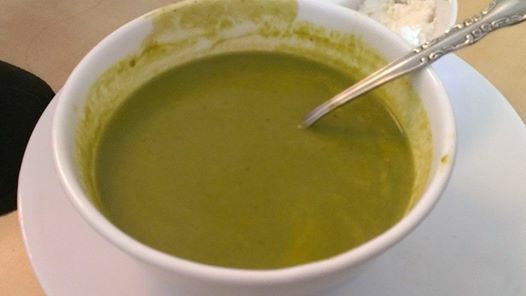 Today I am going to share with you a very GREEN soup. So if you have kids, like MJ, who will have nothing to do with green food then this is not the soup for them. I am also lucky in the sense that the Monkey has no real food aversions as long as he knows everything that is going into the meal. Obviously he needs to make sure we aren’t trying to trick him. He is also willing to try new foods for the most part and if he says he does not like something once he has tried it on three separate occasions then I wont serve it to him but at least he is willing to go ahead and take a bite or two before saying flat out I don’t like this. Getting the Monkey to this point took a lot of consistency in the beginning. He was always a decent eater and he has always seemed to like an assortment of vegetables but meat was the food item he disliked the most. This probably plays a lot on his oral motor issues seeing as you do really need to chew meat. He can’t just mash a cooked piece of meat with his tongue and then swallow it as he can with cooked vegetables. So I think that has played a big part in his avoidance of certain foods. Ok well lets get on with the soup. If you decide not to make the broth then you will probably need to season the actual soup with a bit of poultry seasoning and thyme to get the same flavour and I can not guarantee it will taste as yummy. Place chicken in a large stock pot and cover with water. Add herbs and seasoning. Bring chicken/water to a boil. Allow to boil about 5 minutes so that you can skim off any foam which often will form on the top. Reduce heat to medium low (around 3 on electric range) and cook stock for 2 hours. At this point you will allow the stock to simmer for another 1 – 1.5 hours. Once cool I usually pour the stock into glass mason jars and store them in the fridge to use for recipes like the soup I am about to share. Now on to the soup. This soup is light and flavorful. It be the perfect soup for a dinner party as an entree. Add all ingredients except for the salt and pepper to a soup pot and bring to a boil. Reduce heat and simmer till vegetables are nice and tender. About 20 – 30 minutes. Once cooked remove soup from heat and pour into your blender. Blend soup till smooth, pour back into pot and season with salt and pepper. Serve hot. As I mentioned above if you use store bought stock or a different stock recipe then the one listed above you may need to season this with at least 1 tsp poultry seasoning and 1/2 tsp thyme. These are my rough estimates however as I have always used my own stock. Such a simple soup but so very yummy. Hope you enjoy. I love soup and I love both spinach and zucchini… I must try this recipe soon! Me too! If you try it I hope you enjoy it!